Is it just us – or do some the skin doctors whom we seek beauty treatments with just seem ageless? While they may have loads of experience, both in and out of the operating rooms, under their belts, that’s certainly not showing on their faces and bodies. How (in the world) did they escape the curse of time and aging? We speak to beauty expert Dr Kenneth Lee, a veteran in the aesthetics industry for an inside scoop into what a skin doctor does to look absolutely flawless even as he ages. Mind you, this man may be in his forties yet look nary a day past his thirties. What sorcery! Your pores expand as gunk accumulates in them—and the older you get, the more likely they are to stay expanded. The loss of collagen in your skin is also one of the reasons why your pores look bigger with age, according to Dr Kenneth Lee. 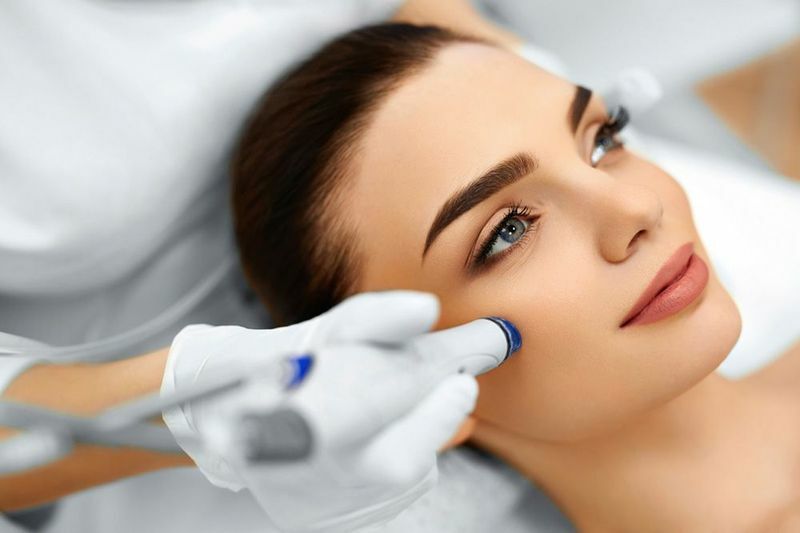 Besides using cleansers with BHA that are capable of really dissolving all the oil and grime within the pores, you should also consider a pore-mininizing laser. Top on Dr Lee’s list is Pico Smooth laser. “This laser has largely replaced the old ‘laser peels” says Dr Lee. Pico Smooth uses a fractionated picosecond laser to stimulate LIOBs (laser-induced optical breakdown) or what we laymen term ‘pockets of collagen’ within the skin. The effect of a few sessions can refine skin so much that a program of this laser is aptly called ‘Glass Skin program‘. By now you probably know that you need a broad-spectrum sunscreen with at least an SPF 30 is the minimal UV defense you ought to adopt. And that you have to slather a tablespoon’s worth of the stuff on your face and a shot glass–size dollop on your body…and that it’s necessary to reapply every two hours if you’re outdoors, including any time spent in your car. Now you just need to do it—every single day. Not everyone can adhere to this recommendation so closely that is why there are simply tricks to ensure you get the best UV defense while looking cosmetically acceptable. Consider a skin brightening primer with UV or a BB cream with not only UV shield but also skin enhancing benefits. Lastly, for those who want absolutely no chance of UV-induced damage, Dr Lee suggests adding on Guardian Angel— this cleanser leaves an invisible ionic UV film on your skin after each wash. If you go to bed 15 minutes earlier, progressively, for four nights running, you’ll establish a routine where you get an extra hour of dark circle-zapping rest. For your best shot at the necessary eight hours, quit the coffee after 3 P.M. and avoid exercising in the three hours before bedtime. Log off in plenty of time, too—your face is more important than Facebook. And stop hitting the snooze button the next morning—fragmented sleeping just makes you groggier. Of course there are also genetic reasons for why dark eye circles persist even after a good period of shuteye. In these cases, there is no reason why you shouldn’t give yourself an added edge with some undereye fixes such as Revitalift, says Dr Lee. They’re among your best weapons against pollution and sun. Besides the multi-tasking Vitamin C, look out for more potent new age ingredients such as Resveratrol. Its best to layer on your skincare so the penetration is optimal. For ladies who wishes to skip the multi-step home regime, opt for a quickie boost in skin antioxidant levels by going for Vitamin Therapy. this in-clinic facial saturates your dermal layers with vital vitamins and nutrients so that your skin has all the resilience it needs to look its very best with minimal effort. Retinol rules—it’s “the only thing that’s been proven to reduce fine lines over the long-term,” Dr Lee says. But like even the best long-term relationships, it isn’t 100 percent perfect. It can increase sun sensitivity (that’s why it’s best applied at night) and it makes some women peel, flake, redden, and itch. That’s why how the retinol is formulated and when it is applied is key to its success. An evening formulation that is creamier like Age Defy excels in slowing down ageing while a water based formulation with mild fruit acids like Super Helper is targeted to stop pimples and acne in its track. Dr Lee advises taking things slow: Dab it on every other night, or dilute it with plain moisturizer, until you know your skin can handle it. You are too thin—at least around the eyes. Don’t rub, poke, or otherwise fiddle with the skin there. “Every time you do, you risk breaking delicate blood vessels, which leads to darkening, dulling, and thickening of the surrounding skin,” says Dr Lee. Like it or not, eye creams are a must if you want to protect this delicate area. As the skin around our eyes are devoid of oil glands, the type of skincare that will deliver optimal benefits to this area has got to be different from the rest of the face. Dr Lee says an eye cream with vitamins such as Dream Cream or an organic oil that is tailored to this area like Emerald oil can bring out the best in peri-orbital skin. Of course, there’s no harm in enlisting some high tech help whe it comes to the skin around the eyes. Miracle Eye Reviver program flexes its antiaging prowess using SmartX and neogen plasma laser. It’s been shown to increase elastin production, which can reduce crepiness. What do you do? Take care of your body to take care of your skin, that’s what. Smoking is an infamous wrinkle factory that destroys collagen and elastin. (But you knew that.) Less well known is that more than one glass of alcohol increases inflammation in the bloodstream, “which can hasten sagging over time,” Dr Lee says. Eating too much sugar is also a vice for your skin (not to mention your waistline), he says—it may affect the body’s ability to repair damaged collagen. Wrinkles may be the classic sign of aging, but studies show that most people view mottled skin as even older-looking. The good news: dark spots can be faded in as little as a month with the right treatments such as Porcelain Skin Program‘s pico pigment laser. Adding on the right topicals can hasten your skin to its natural fair and flawless endpoint.